Fill bottle with liquid product. Firmly press the insert with ball into bottle until you hear it click. Place cap on bottle. COMMENTS: This roller bottle is fantastic! 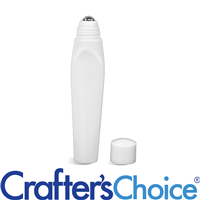 It combines an opaque shatter resistant container with a staineless steel ball dispenser. It holds a generous amout of eye serum, perfume oil and pulse point EO blend oil. It is also sleek and attractive, no one minds carring this around in their bag or purse. COMMENTS: I LOVE this tube for my eye serum. I have made it for several years in a cream form but it didn't sell well. I decided to make it into a serum and put it into these tubes and have sold out of it at each show we have had since then. A great addition to our line! • Labeling is a problem due to the shape. • Label suggestions will be helpful. COMMENTS: I do like this for my eye serum. Very easy to apply product precisely. The only little issue is diffulty labeling for retail due to shape of the tube itself. COMMENTS: I love these bottles. Not only are they very professional looking, and useful for a number of products, the price is fantastic!! If they were available in different colors they would be perfect !! I use these for perfumes,lip gloss,lip oils & eye serums. "What labels do you recommend for this bottle? Thanks!" Staff Answer This is certainly up to you as to what type of label you would like. You might have about 1.5" of length to use and the circumference is approximately 2.5". We always recommend having the bottle in hand before ordering or designing labels. "Can the body splash base be used in these rollerball bottles,or is it too thin of a liquid? Thanks." Staff Answer You can use the body splash in this bottle but you always want to test your product to be sure it is compatible with your packaging. "What type of metal is the roller ball made from? I don't want anything that is aluminum." Staff Answer The roller balls are made of stainless steel. "Hello, Do you carry a shrink band that fits the 18ml white round bottle? Thanks, Melissa Overland"
Staff Answer Yes, the 35 x 90 band fits this very well.